Ariane 5 is a heavy-lift rocket that is designed to take satellites and other payloads into geostationary transfer orbit or low-Earth orbit. The rocket is operated and marketed by Arianespace, and built by prime contractor Airbus Defence and Space. The program is supervised by the European Space Agency (ESA) and the CNES, the French space agency. Ariane 5 currently has two operational configurations: Ariane 5 ECA and Ariane 5 ES. Past configurations included Ariane 5 G (1996-2003), Ariane 5 G+ (2004) and Ariane 5 G5 (2005 to 2009), according to the ESA. All Ariane 5 rockets launch from the Guiana Space Center in French Guiana. ESA describes Ariane 5 as a highly reliable rocket at an affordable price for launches. "Ariane 5 is the cornerstone of Europe's independent access to space. Its reliability, availability and affordability are based on a strategy where a significant part of the exploitation costs is financed through commercial activity," the agency said. As of April 2018, the Ariane 5 ECA has launched 70 times and the Ariane 5 ES eight times, according to ESA. These launches make up the vast majority of the Ariane program launches, which stood at 98. The Ariane 5 line has launched more than 200 satellites during its operational career, according to Arianespace. A successor launch vehicle called Ariane 6 is expected to have its first flight in 2020, potentially halving the cost of launch services, according to ESA. Ariane 5 ECA: 166 to 174 feet, or 50.5 to 53 meters (Arianespace and the European Space Agency list different heights on their websites.) This rocket is designed for geostationary transfer orbit (GTO). Ariane 5 ES: Up to 164 feet (50 m). This rocket is designed for low Earth orbit (LEO) or medium Earth orbit. The Ariane 5 program's first launch (G type) was on June 4, 1996, and failed because of a programming error. Range safety officers elected to destroy the rocket during the launch, according to the Ariane 5 Flight 501 failure report. On Oct. 30, 1997, an Ariane 5 G rocket underperformed during its launch, which was the second of the program. While it launched its satellites into space, the satellites arrived in a lower orbit than planned, according to the Economist. 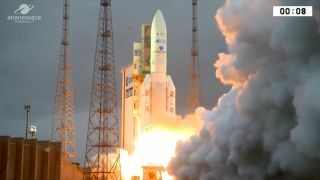 The first flight of Ariane 5 ES on March 9, 2008, met with more success, as it launched the first Automated Transfer Vehicle (ATV) that sent cargo to the International Space Station. The first ATV was called Jules Verne. Ariane 5 ES also successfully hefted four other ATVs, which were called Johannes Kepler, Edoardo Amaldi, Albert Einstein and Georges Lemaitre. The program concluded in 2014. Another Ariane 5 G rocket had trouble bringing its satellites to orbit on July 12, 2001. Because the upper stage underperformed, according to CNN, both the Artemis and BSat payloads were put in the wrong orbit. The Artemis mission recovered when operators used some of its on-board fuel to raise it to the correct orbit, but BSat could not be recovered. The first Ariane 5 ECA flight on Dec. 11, 2002, ran into some trouble when the Vulcain 2 main cryogenic engine failed, according to the European Space Agency. On Jan. 25, 2018, an Ariane 5 ECA rocket managed to get its satellites into space after flying off-course during the launch, according to Spaceflight 101. The SES 14 and Al Yah 3 satellites, however, were within striking distances of their operational orbits. Both satellites were reported in good health shortly after the launch, and operators planned to proceed with their missions.